Family Food Finds: Foodie Friends Friday Linky Party and Giveaway!! Foodie Friends Friday Linky Party and Giveaway!! Happy Friday everyone! Today is a very special party because if you are one of the top three recipes this week, you win an amazing prize! 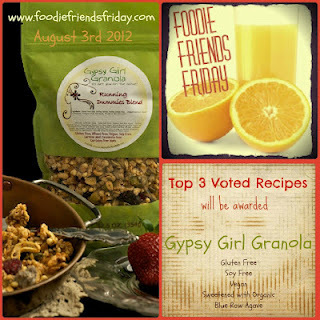 Gypsy Girl Granola has graciously agreed to award one bag to each of the top three links! Her granola is gluten free, soy free, vegan, and delicious! Top Voted for July 27th! Last but not least...these are your Hosts for the week.